It is my pleasure to announce the winners of the April Fool's Day drawing kuntest! The following badass contestants will have their work displayed in this year's ENTARTETE KUNTS underground art exhibit opening on June 20th in Portland, Oregon! They also get a Destroying Angels shirt for their efforts (priceless!). 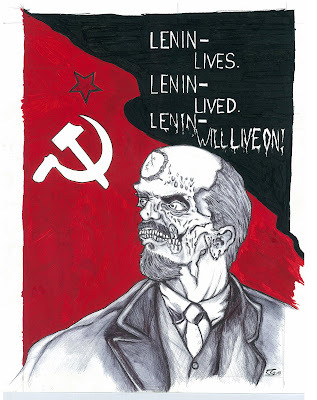 Constantine Glinka rose to the occasion with this drawing of his favorite "dictator, tyrant, or general enemy of humanity"...a zombified Lenin! Constantine also sent this funny zombie drawing to seal the deal! It takes guts to enter your art in a contest...har har. Congratulations, Mr. Glinka! 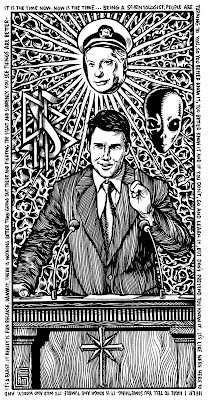 Glenno Smith sent this drawing all the way from Australia and nailed the winning entry with his portrayal of Tom Cruise as chief enemy of humanity. He also had a great story about raiding the Australian Scientologist headquarters and being chased for hours by security. Glenno's art rules! Check out his extensive online sketchbook here! Another contest will be posted soon. Mark your calendars for the ENTARTETE KUNTS 2008 exhibit on June 20th! My drawing for Ghoul will be on display in New York City this month as part of the third annual 'ZOMBIES' group exhibit at MF Gallery! I'll also be premiering my new limited edition 3-D prints! They turned out great and each 16" X 20" print is signed & numbered AND comes with its own 3-D glasses! 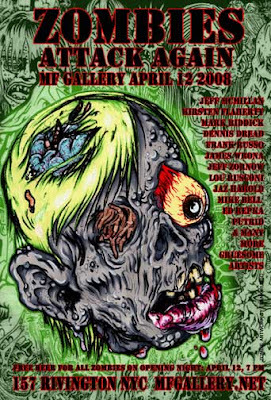 The MF Gallery show opens April 12th and all eastcoast flesheaters are encouraged to attend!